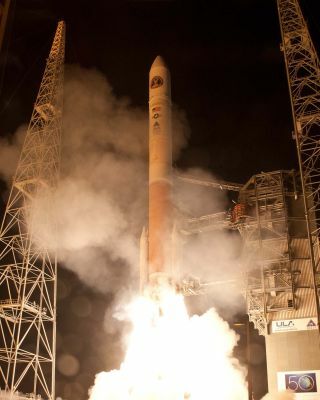 A United Launch Alliance Delta 4 rocket blasts off from Space Launch Complex-37 with the Air Force's Wideband Global SATCOM-4 (WGS-4) satellite at 7:38 p.m. EST on Jan. 19, 2012. Funding for unclassified U.S. military space programs and activity would decline by 22 percent, to $8 billion, under the 2013 Pentagon spending request released by the White House Monday (Feb. 13). The Pentagon attributed the proposed funding decline to reduced procurement plans for satellites and launch vehicles, along with the cancellation of the Defense Weather Satellite System (DWSS), which was done at the behest of Congress. The U.S. Air Force halted work on the DWSS program Jan. 17. Noticeably absent from the 2013 request is funding for a DWSS follow-on system, for which Congress appropriated $125 million in 2012. Also absent from budget documents released Feb. 13 is a funding line for a second Space-Based Space Surveillance satellite, designed to keep tabs on activity in Earth orbit. Maj. Gen. Edward Bolton, deputy assistant secretary for budget at the Air Force, said the 2013 request includes funding to refurbish two legacy Defense Meteorological Satellite Program (DMSP) weather satellites that have been in storage for several years. He declined to say whether the request includes funding to design a follow-on system. The biggest single line item in the Pentagon’s space budget request is the Air Force’s Evolved Expendable Launch Vehicle program, used to launch most of the Pentagon’s operational satellites. The service is requesting $1.68 billion for the program next year, a sum that covers the procurement of four new rockets and associated services and activities but does not include launches to be procured on behalf of the U.S. Navy or National Reconnaissance Office, budget documents said. In a bid to curb its rising launch costs, the Air Force is pursuing a block buy strategy under which it intends to procure six to 10 rockets annually from contractor United Launch Alliance over a period of three to five years. That plan has been criticized by the U.S. Government Accountability Office and has detractors in Congress as well. The Pentagon also announced plans in the budget request to close the Operationally Responsive Space program office at Kirtland Air Force Base, Calif., and transfer those activities and experience to the service’s Space and Missile Systems Center in Los Angeles. Operationally Responsive Space refers to space capabilities that can be developed and deployed rapidly in response to emerging military needs. $1.27 billion for the GPS 3 satellite navigation system, a sum that includes the cost of procuring two new satellites in 2013. $950 million for the Space Based Infrared System missile warning program, which would allow Air Force to procure two more satellites. $786 million for the Air Force’s Advanced Extremely High Frequency secure satellite communications system. The Air Force intends to order two more of those spacecraft later this year. $36.8 million for the 10 satellite Wideband Global Satcom communications system. The Air Force recently ordered the ninth satellite in that series and plans to order the 10th later this year. $167 million for the Navy’s Mobile User Objective System of narrowband communications satellites. That sum funds on-orbit testing of the recently launched first satellite and preparations to launch the second, among other activities.